Albert Einstein? Théophile Gautier? Alexis de Valon? Samuel Taylor Coleridge? Helena Blavatsky? Dr. Paul F.? Heidi Quade? Bonnie Farmer? Charlotte C. Taylor? Doris Lessing? Nicolas Chamfort? Horace Walpole? I have been unable to find any solid information to support this ascription. What do you think? This topic is large, complex, and tangled. QI believes that the remark evolved from a family of interrelated sayings that can be traced back many years. These sayings did not have the same meaning, but QI believes that the earlier statements influenced the emergence of the later statements. Below is a summary list with dates of the pertinent quotations. The shared theme was an examination of the connections between chance, coincidence, Providence, and God. The term “Providence” refers to the guardianship and care provided by God, a deity, or nature viewed as a spiritual force. Statements in French are accompanied with a translation. Details for these statements together with additional selected citations in chronological order are given below. The citation dated 1777 from Horace Walpole, and the citation dated 1795 from Nicolas Chamfort were explored extensively in a separate entry on this website. Here is the title of the entry which is a clickable link: Chance Is the Nickname of Providence. The motivated reader is encouraged to read the linked material which will not be repeated here. Vous auriez tort de vouloir forcer la main au hasard; laissez-le agir, il sait bien mieux que vous ce qu’il vous faut.—Le hasard, c’est peut-être le pseudonyme de Dieu, quand il ne veut pas signer. The expression in bold face can be translated into English as follows: Chance is perhaps the pseudonym of God when he does not want to sign. In other words, “chance” is used to describe situations in which God does not wish to unambiguously avow his actions. Le hasard, a dit quelqu’un, c’est peut-être le pseudonyme de Dieu, quand il ne veut pas signer. The term “sign manual” refers to a personal signature, especially a royal signature. For example, an official document or an executive act from a sovereign might have a sign manual. “Fortune” “Chance is but the pseudonyme of God for those particular cases which he does not choose to subscribe openly with his own sign-manual” . . . Chance is but the pseudonym of God for those particular cases which he does not choose to subscribe openly with his own sign-manual. Chance is but the pseudonyme of God for those particular cases which He does not choose to subscribe openly with His own sign-manual. Coleridge. Chance is but the pseudonyme of God for those particular cases which he does not choose to subscribe openly with his own sign-manual. There is no “chance” in Nature, wherein everything is mathematically co-ordinate and mutually related in its units. “Chance,” says Coleridge, “is but the pseudonym of God (or Nature), for those particular cases which He does not choose to subscribe openly with His sign manual.” Replace the word “God” by that of Karma and it will become an Eastern axiom. 1895: Il faut, dans la vie, faire la part du hasard. Le hasard, en définitive, c’est Dieu. 1922: In life we must make all due allowance for chance. Chance, in the last resort, is God. This above statement by Anatole France was clearly distinct from the remark of Théophile Gautier. Nevertheless, during the ensuing decades confusion surfaced, and the words of Gautier have sometimes been assigned to Anatole France. Le hasard c’est peut-être le pseudonyme de Dieu, quand il ne veut pas signer. FRANCE, Anatole, 1844-1924, pen name of Jacques Anatole Thibault, French novelist and critic. He defined coincidence as a miracle in which God chose to remain anonymous. One who watches for God in “coincidences” finds sustaining faith in many ways. “I never think of the future. It comes soon enough.” Albert Einstein. “A coincidence is a small miracle when God chooses to remain anonymous.” Heidi Quade. In the text above, the first quotation was attributed to Albert Einstein; hence, his name was adjacent to the quotation with “coincidence”. 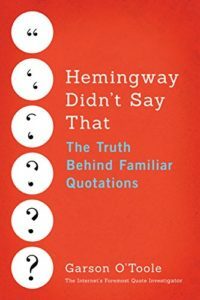 One important mechanism for generating misattributions is based on the misreading of neighboring quotations. A reader sometimes inadvertently transfers the ascription of one quote to a contiguous quote. But QI does not know whether this text contributed to the misattribution. It might be completely unrelated. “Coincidence is God’s way of remaining anonymous,” says Mrs. Taylor, who at 74 devotes much of her time to getting the monastery ready for the first novices. “Coincidences,” the writer Doris Lessing once said, “are God’s way of remaining anonymous.” Small Miracles attempts to strip away that facade of anonymity, and demonstrate that these seemingly random moments are instead the full and vital expressions of God’s handiwork. In conclusion, Albert Einstein was first linked to the quotation under examination many years after his death. There is no substantive evidence that Einstein ever employed the saying. Precursors circulated for a long period of time before the modern statement containing the word “coincidence” emerged. The 1845 statement written by Théophile Gautier was particularly interesting. Image Notes: Green possibility sign from geralt at Pixabay. The sign has been modified by QI. Red dice by caro_oe92 at Pixabay. Images have been cropped and resized. Update History: On April 21, 2015 the 1997 citation for Doris Lessing was added.